Storage of submarine cables for short or long durations requires a suitable and functional storage system meeting the cable specifications. Modern middle- and high-voltage power cables, as for example used in the offshore wind farms, are to be handled within specific parameters. 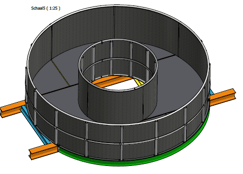 These parameters include minimum bending radius, allowable tension, stress and bending. In principle there are two types for storage of power cables onshore or offshore (on a vessel for transport or installation). The first is a carousel or turntable, which can be considered as a rotating tank of certain diameter in which the cable is spooled. The second is a static coil, a static non-rotating tank in which the cable is coiled. The choice between the types is depending on the type of power cable, whereas the carousel is a more complex and expensive solution. Hulst Innovation Cable Equipment BV (HICE) gained years of experience building cable handling equipment and has developed a perfectly working system for cable storage and transport. 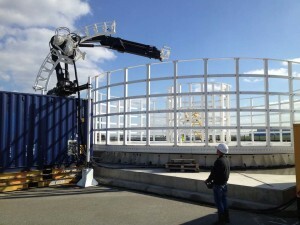 The MOST (Modular Onshore Storage Turntable) is a modular system that, due to its dimensions, can be transported by sea or road to any location around the world for rapid re-assembly on site. The hydraulic lifting system ensures a reduced and equally spread load to the surface underneath the MOST. 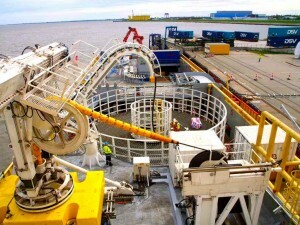 The major advantages of a modular system compared to conventional turntables, already in use in the offshore industry, are the lower transport cost, shortened mounting times and the use of standard (mobile) cranes on site, mainly possible due to the reduced weight and dimensions of the individual parts. 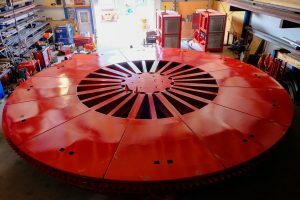 For use on board vessels for transport or installation, HICE has developed an offshore unit called the MOT (Modular Offshore Turntable). This turntable is based on the same principles as the MOST, but differs in many details. For offshore use double drives and controls are applied and when ‘parked’ the MOT is resting on its parking-blocks instead of the bearing wheels. The above is required to deal with higher forces and loads resulting from waves and vessel motions. The MOT was optimised with end-users and experience gained from practice and can easily be installed on board a transport or installation vessel. The cable can be safely handled or laid through the turntable and ancillary systems without risk of damage. The design is kept simple and easy to maintain to ensure reliability. The construction of the MOT is improved and strengthened to meet the offshore requirements and has been approved and certified by GL-DNV (Germanische Lloyd – Det Norske Veritas).